This new official University of Texas Tower license plate will hold up to 7-letters and becomes the third UT branded license plate available to purchase. Alumni and fans of The University of Texas now have another way to express their support for the Longhorns with the release of the redesigned University of Texas “UT Tower” license plate. My Plates, the State of Texas vendor for specialty license plates, has been working with the University to finalize this new addition. The new plate design features the iconic UT Tower entirely in the familiar shade of burnt orange. The famous tower often is bathed in all orange to recognize significant achievements by UT staff, students and teams, as well as for class welcoming events and commencements. In addition to the Tower, the plate also features the burnt orange Longhorns silhouette logo and the ever-popular slogan “Hook ‘em Horns” along the bottom legend of the plate. The Tower plate is the third UT plate in the My Plates inventory, joining the UT Longhorns plate and a plate that is only burnt orange and white. 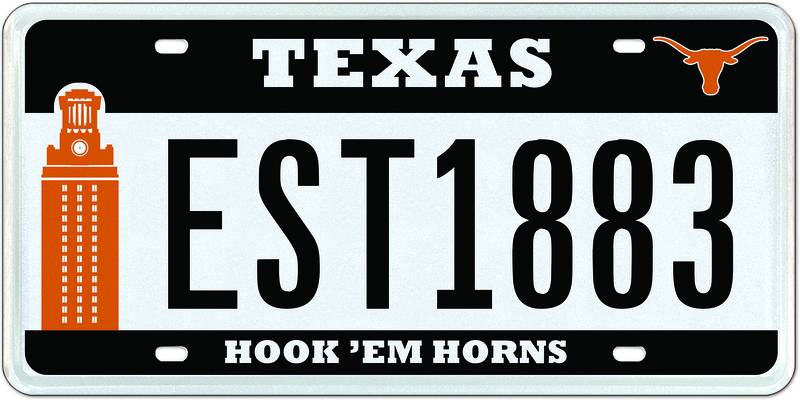 To buy the new UT Tower plate design or one of the other two Longhorns plates, visit http://www.MyPlates.com. All plates start from only $50 a year or less than $33 a year when purchased for a five-year term. You do not have to wait until you receive your renewal notice; you can order at any time. All My Plates plates are available for cars, trucks, motorcycles, trailers and RV’s, they can also carry the International Symbol of Access logo. If you have the prior UT plate design, and you love it, you may continue to renew it. You may also replace it with the new redesigned tower plate. All it takes is a visit to your local county tax office and a replacement fee of $6.50. My Plates designs and markets new specialty license plates as a vendor for the Texas Department of Motor Vehicles. Texans have bought more than 300,000 My Plates since November 2009, putting more than $52M in the state general revenue fund. My Plates’ goal is to create a long-term, mutually beneficial relationship designed to maximize revenues for the state through the sale of My Plates specialty plates. http://www.myplates.com. The Texas Department of Motor Vehicles (TxDMV) serves protects and advances the citizens and industries in the state with quality motor vehicle related services. For every $1 it spends, the TxDMV returns $11 to the state. The agency currently registers 24 million vehicles; issues more than 7 million vehicle titles; licenses more than 38,000 motor vehicle dealers and distributors; credentials nearly 60,000 motor carriers; issues more than 800,000 oversize/overweight permits; investigates more than 15,000 complaints against dealers and motor carriers; and awards grants to law enforcement agencies to reduce vehicle burglaries and thefts. Learn more at http://www.TxDMV.gov.